At the core of Securis’ data destruction process is our electronic media shredding services, which can be performed onsite at the customer’s premises or in our secure, access controlled facilities. Securis utilizes an industrial shredder to chop, mince, and shred hard drives, cell phones, tapes, and other data storage devices into tiny, inaccessible fragments. Our system is completely self-sufficient, utilizing power from our secure service truck’s internally mounted generator, requiring no use of any facilities resources to operate. As critical as the shredding machine itself are the secure, meticulous and documented processes to get hard drives from your facilities to the machine and disposing of the shredded material afterwards. 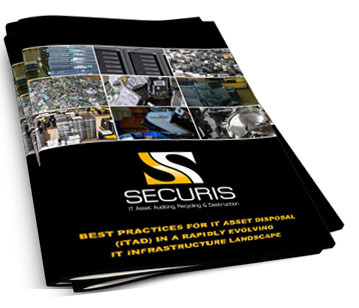 Over the last decade, Securis has invested in a proven, end-to-end process that provides protection and accountability through the entire chain of custody of your IT assets. Property management interfacing– coordinating with property management to get permission to use elevators, etc.